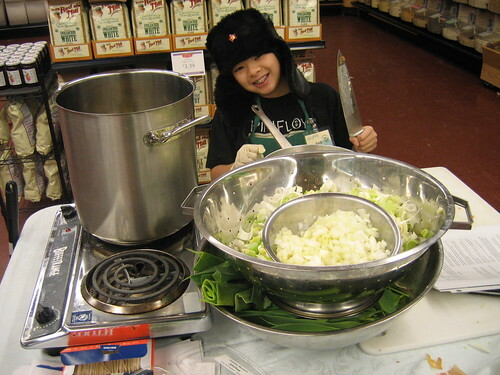 A great soup begins with simple ingredients — some meat, vegetable or seafood with water and salt. Today we start with a chicken broth and then enhance it to prepare a family of delicious soups. Happy New Year! Here are the recipes involving chicken broth. Here is the recipe for a rich vegetable broth that can substitute the chicken broth. Alton Brown is one of my favorite cooking teachers. After watching his “Good Eats” episode on bananas, I was inspired to make this showy dessert. Here is the recipe. Gumbo is a chunky tomato-based soup full of flavor. This recipe was given to me in a sealed envelope marked â€œTop Secretâ€ by Bill Poynton, a member of the Just Food Coop. Thank you, Bill, for sharing your secret. Gumbo is derived from the West African word â€œgomboâ€ which means okra. The name implies that okra is a necessary ingredient. The other necessary ingredients are a dark brown roux (flour cooked in oil) and gumbo filÃ© (pronounced fee-lay), which is the powder form of sassafras leaves. Okra evokes both affection and aversion. Those who hate it cite the vegetableâ€™s slimy texture. In this recipe, the okra is sautéed before it is added to the rest of the ingredients to reduce its sliminess. The demonstration was a resounding success. The only unpleasant experience was taking 3 hours to cook the flour. I need help to learn how to get this done faster. Suggestions, anyone? Thomas Keller is another one of my favorite French cooking authors. This soup shines with organic vegetables that our Co-op carries. Start with a home-made chicken stock enriched with carrots, leeks, onions, and herbs. One evening, a desperate looking lady came to the Co-op clutching a can of soup from a conventional national brand. She had just visited her doctor and was told to avoid several of the ingredients found in her favorite conventional soup. 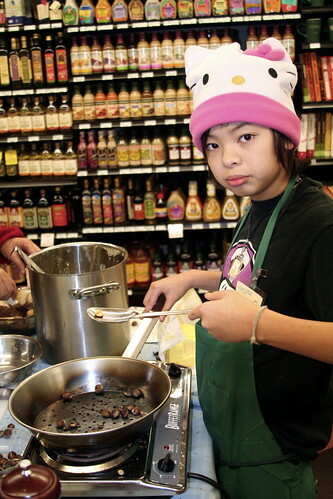 She asked me if our store carried a similar soup that did not have the harmful ingredients. Naturally (no pun intended), we did. The experience inspired me to cook popular soups using wholesome ingredients and classical methods. 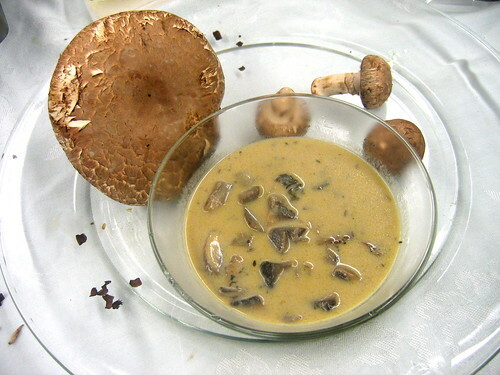 The result was a Cream of Mushroom Soup (Potage Veloute Aux Champignons). Since I was using mushrooms, I also prepared a marinated mushrooms.